How many times this dog goes through reincarnation is a story itself. Really good books. 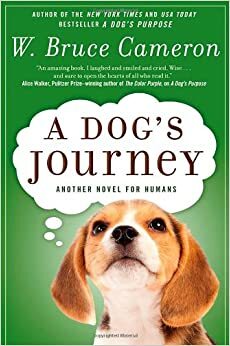 A Dogs Journey is the sequel to A Dog's Purpose. I'm definitely going to, but it will be awhile as I'm 33rd on the waitlist at the e-library! However, I keep meeting dogs who are just irresistible, their personality so unique, so engaging. Plus they help so many of my friends, often elderly now...everything from service animals, for seizure alert they are unbelievable accurate, for example...to the most loyal and loving of companions. I am not sure how long Betty would even survive without Cindy's companionship...Cindy goes everywhere with Betty in a little leather bag! @Virginia : I think you'll really like these books. The way dogs reincarnate until they find their purpose in life. The whole premise makes them worth reading. Rooster I have just ordered it from the library...as you already know, the premise is intriguing to me! @Virginia: I thought of you when I read them. As I believe the same, it makes you wonder if humans have the same experience. I like animal stories - and these two books look much like "just read them and you will love them". As for the preferred animal, I love (or at least respect) all of them. @Marianne: You'll love these books. A break from usual and I loved them. I am sure that they are good, as I read lots of stories and documents about and with animals. Like Virginia, I'm more of a cat person, but these books look good! Wait a minute! Don't humans also reincarnate until they find their purpose in life? The song and the voice are exquisite, exactly as Virginia says. Yes, Judy Collins and that song have been favorites of mine ever since I first heard them. A good choice, T(h)ink. And Virginia likes it too! Rooster, I have just discovered that the great 19th century humourist Ambrose Bierce (1842-?1914), in his Devil's Dictionary, has included a definition of DOG! I loved it, being: "A kind of additional or subsidiary Deity designed to catch the overflow and surplus of the world's worship." I don't think I'll get a chance to read these two books, but I do love doggies. Do you download the books from web? From which websites do you download them? Good movie or good book? What would you prefer? What are some solitary pursuits that you enjoy?